Seth Godin is one of the foremost thinkers of our era. He is a trendsetter a ruckus maker. He inspires people to think outside the box. He's also the most-read blogger online. He's written dozens of books and I've read many of them. He also a podcast called Akimbo. It's sort of a spoken blog where he talks about important things we need to think about. And how we can grow, either in business or in our personal lives. It's brilliant. 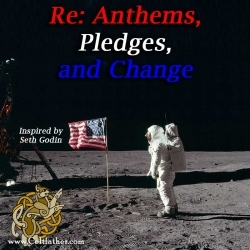 He released an episode called "Anthems, Pledges, and Change" which inspired this podcast. I confess, I've thought about podcasting my thoughts on his podcasts because he's THAT inspiring. But this is one of the first of me actually doing it. That's because this podcast defines my career and my life. If you don't understand this, I'm not entirely sure why you follow me. Because this is it. So I highly recommend you listen. In my episode, I spent 20 glorious minutes understanding how change has happened for good and ill in my own career. I learn from my past experiences. I find new ones to move forward to find new success. I don't know that I did it all right. But I think it's a good conversation. It's a good starting place for you and me to come together move past the traditional to find peace and happiness in the new and undiscovered, to make change happen. I hope you love the show! Special note: Seth Godin has a new book out. It's called This Is Marketing. I highly recommend it! If you enjoy this podcast, please subscribe at Celtfather.com. While you're there, sign up to my mailing list to get 21 songs for free! I also have relaunched the Pub Songs Podcast. You can hear my album Happy Songs of Death played from start to finish, plus find out a little bit about how the album came to be. More shows are coming. Subscribe now.